I couldn’t find a computer program I liked for doing ABX tests and so ended up writing my own. The full program listing (in the R language) is given below in case someone finds it useful. Plenty has been written about ABX testing so I’ll give just a quick précis here. Suppose you have two different audio sources, A and B, and you think you can hear the difference between them. Q: How does one establish this hypothesis in a scientific way? A: With a Statistical Hypothesis Test, of which ABX is just one type. The test subject is presented with samples of stimuli A, B and X, where X is identical to either A or B: the subject must decide which. On each trial X is randomly set to either A or B. 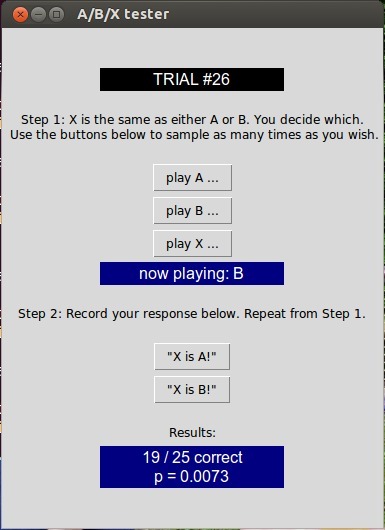 Several trials are run (say N=20) and the number (n) of correct responses is tallied. The null hypothesis here is that the subject cannot discriminate between A and B, in which case their responses are indistinguishable from random guessing: the observed number of correct responses is then a random variable sampled from a binomial distribution. Under our null hypothesis the probability of getting at least n correct guesses in N trials is So you calculate p using this formula. If p is sufficiently low (say, less than 0.05) then the probability of having achieved the correct responses by sheer guessing is very low, giving you strong statistical evidence for rejecting the null hypothesis (hence concluding that the test subject actually can discriminate between A and B). If p isn’t low then you have no grounds to reject the null hypothesis — all you can do is run more trials until you get a low p or until the test subject gives up and admits they’re guessing. There are some gotchas, like having to guard carefully against “tells” such as switching noises or unmatched volume levels. Only then can you be sure the subject is actually comparing A and B and not just some quirk in the apparatus. # You need to edit these two functions, presumably using the "system"
# vice versa. Here I use 'mpc' to switch between outputs in mpd. debug <- TRUE;        # show gory details on the command-line? showresults <- TRUE;  # let subject know how they're scoring?